Nadia: Traditional black Italian eggplant, 7-8 inches long. Glossy skin with tall, sturdy plants that will fruit under cool conditions. Dancer: Light violet Italian type, though thinner than your average globe. Mild, not bitter. Strong plants with high yield. Galine: Classic bell-shaped Italian variety. Produces early and dependably, even in the north! Large fruit, averaging about one pound each. Casper: Snow white inside and out. Italian variety that does well in northern climates and produces early. Fruit is generally 5-6 inches long. Black Beauty: An heirloom introduced by Burpee in 1902. Italian style, very early. Best harvested fresh. Nubia: Gorgeous! Purple and white striped Italian type eggplant. On the smaller side. Late yielding in the north. 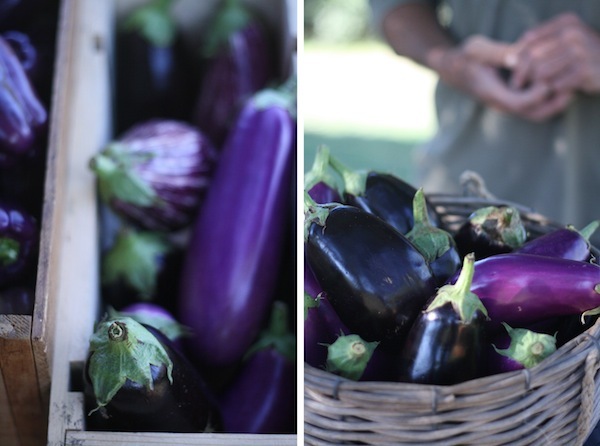 Fairy Tale: Tender, plum, sweet little Italian-style eggplants. Same variegation as the Nubias—violet and white stripes. Great for growing in containers. Long Purple: Asian variety, long and thin—8 to 10 inches. Beautiful dark purple skin. Sweet! Orient Express: Long, thin dark purple—8-10 inches. Asian type with very glossy skin. Tender, delicate, and thin-skinned for fast cooking. Gretel: A tiny white eggplant. The plant fruits in clusters and is very compact. Another good variety for growing in containers! And finally, a recipe for eggplant caponata. Many of the growers told me they like Asian style eggplants best for this kind of recipe. The skins are thin, and they break down faster than the skins of the Italian style eggplants. But for grilling, you want a nice, thick globe eggplant—something like Black Beauty or Nubia. The season should last til mid-October, unless we get an early frost. Enjoy! Caponata is a classic sweet and sour Italian eggplant dip. It's excellent spread on pieces of good, crusty bread. A note for your shopping list—6 ounces of olives is a lot! Make sure you look at the weight on the jar. This recipe is adapted from one I found on the Saveur website. Warm up the olive oil over medium-high heat in a large heavy pot. Add the eggplant and fry, stirring often, until golden brown. Put a colander over a bowl and pour the oil and eggplant into the colander. Set aside. Return 1/4 cup of the olive oil to the pot. Turn the heat back onto medium, add the onion and celery and salt and pepper to taste, and fry until soft and golden. Next add the tomatoes, turn the heat down to low, and simmer for 10-15 minutes, until they thicken up. Add the olives, vinegar, raisins, capers, sugar, and chocolate. Simmer for another 10-15 minutes, stirring occasionally, until thick. Turn off the heat, stir the eggplant back in, and transfer to a serving bowl. Sprinkle with basil and pine nuts and serve with warm crusty bread. We had your eggplant caponata for dinner last night on toasted slices of my spelt bread (see Diary, April 4, 2013). Wow, was it delicious. Thanks, Elspeth! Yours is the best caponata in the universe. I had stopped liking the stuff until I tried yours. It was always too vinegary or too vegetable-y and just not what it seemed to promise, complexity-wise. So as we finished up our toast piled with this one, we sat identifying the ingredients. But of course there is one we missed: the chocolate chips. A magical secret ingredient. Though we should give credit to the local vegetables, too. so, so glad you two liked it! i had never attempted a caponata before i found this one. i love olives and eggplant, and the chocolate chips do add a special something!